During the week I finished these socks. As mentioned in an earlier post about them, these are the first socks I’ve knit for myself and I’m smitten. The two yarns worked really well together and they are so warm, perfect for this time of year. Working on the cuff in only Tough Love Sock meant that I got a bit more of a feel for the yarn, and I quite like it. The nylon content (20 per cent) makes it a wee bit squeaky, but it feels very hard wearing and I’m still completely enamoured with the espresso colourway. There’s quite a bit of both yarns left over, so Matt may score a thin version of Turn A Square to wear under his bike helmet. But only if he’s good and keeps bringing me cups of tea after dinner. Another thing mentioned in a previous post was the pattern, and I still stand by what I said then; it’s a really good pattern and highly recommended it if you’re planning to make knee socks. Actually, the only thing I should mention is that the pattern has a short row heel. While that means you get a nice contrast heel, I’m not sure if I like how the short row heel turns out when you pick up the wrapped and double wrapped stitches. Are they any other forms of construction where you can get that kind of contrast heel? 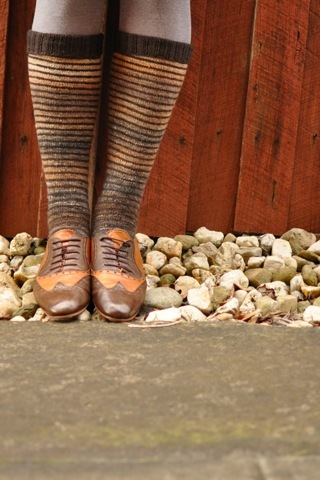 I’m pretty much a beginner when it comes to sock construction so I don’t really know… The heel aside, I’m contemplating making a non-striped pair of these in grey, and with the cabled seam variation given in the pattern. And maybe the over the knee version rather than just below the knee. Finishing these socks means that the red knee sock challenge has commenced. I cast on the first sock on Monday, and I’ve now finished the leg and am onto the heel. Given it’s now just shy of a month before the Sheep and Wool Show, I think they might just be finished in time. Famous last words. They are perfect with those lovely shoes! What gorgeous socks! They, along with your shoes, are the perfect winter accessory. 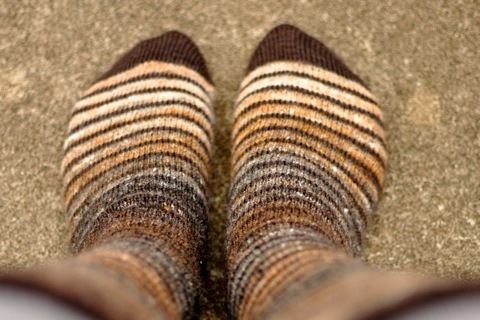 Fantastic sock – I haven’t made socks forever but yours are really tempting me to cast on right now. Great work. Wow! Outstanding. I need socks desperately but haven’t even cast on yet! Your styling and photo’s are fantastic. The socks are just gorgeous, well done, bravo, good stuff and lucky last, right on!! love love love! these are just fantastic. that is one of the best uses of noro ive ever seen. just gorgeous. so my week has been crazy and I’ve just now caught with these. So very glad to see them done and looking so very spiffing. You should be entirely thrilled with these. They’re stunning. What a great combination of yarns. Well done!